Yearlong mission: Astronauts headed for a year in space on the ISS. 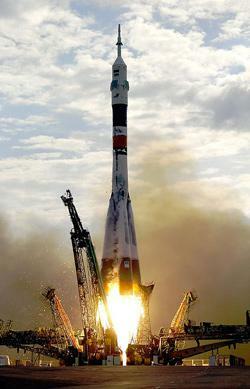 A Soyuz launch from 2003. Update, March 27, 2015, at 20:00 UTC: Success! The launch was on time and flawless, propelling the astronauts to orbit. They are scheduled to meet up with the ISS at 01:36 UTC tonight. Expedition 43, as this one is numbered,† has a number of different research directions, including seeing how the lengthy flight affects behavior, physical function, eyesight, metabolism, and more—things we know are affected by prolonged low-gravity conditions. The reasoning behind this makes sense; a long flight to, say, Mars will seriously hamper astronauts’ ability to move around once they land. I’ll note this isn’t the longest time people will have spent in space; two Russians spent more time on the old Mir space station, and two others spent a year on Mir as well. But this will still be pretty interesting from a biophysical point of view. A lot of work has been done in this field, of course, but having two people up that long at the same with consistent tests should prove helpful. Not only that, but Kelly has a twin brother who will stay on Earth to provide a control group of sorts. His brother, Mark, is also an astronaut (the only siblings who have both been in space) who is married to ex-congresswoman Gabby Giffords. Quite a family. I wonder what the outcome of this mission will be. It may show us that long-term space flight is too debilitating; if that’s the case, then we may need to take seriously the idea of rotating structures to mimic gravity. Those are more expensive and have to be big to avoid the spin making astronauts dizzy. I’d love to see some of those built to test out how well humans can perform on them. I’m sure either way it will help inform longer space missions. Personal opinion time: This mission is also being billed as a precursor to flights using the Space Launch System with the Orion capsule, a future I think is a dead-end for NASA. SLS is far, far too expensive and NASA doesn’t have the budget to make it sustainable. There are serious concerns that building it will cost so much that there won’t be money left for actually using it. I agree with space activist and writer John Strickland on this; Scientific American put up an editorial about this one-year mission, and Strickland left a comment there. In it, he wrote that for the same money SpaceX could deliver a lot more. The Falcon Heavy rocket demo launch should happen later this year; I’d like to see that go successfully first before speculating any further. But it does seem like the right move for NASA. I have very serious doubts about SLS. Anyway, I expect the Soyuz launch of the Expedition will be covered on NASA TV and its Ustream channel. I’ll be watching live, and tweeting about it too. * Also riding on the rocket will be seasoned cosmonaut Gennady Padalka, who will not be staying for the entire duration of this extended mission. † NASA has a peculiar numbering convention for ISS missions. A new Expedition starts when three of the six crew members on board leave (officially when the door to the return capsule closes), so Expedition 43 started in early March, and there are now three people on ISS. Kelly, Kornienko, and Padalka will join 43 already in progress. The three on there now will leave in May, and that’s when Expedition 44 starts. Kelly and Kornienko will stay through Expedition 46, overlapping with the crews from the other Expeditions.